Ben “Abstraction” Burnes is a composer who is behind a number of original and soundtrack albums, and has been consistently releasing music since before his formal debut album Nature’s Echo ten years ago. 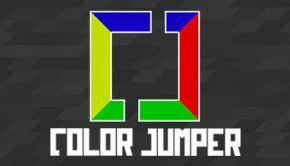 Yesterday, he released a soundtrack alongside a puzzle-platform game he created called Color Jumper released yesterday on Steam. In this interview, Burnes discusses his background in music, and his work on a range of projects. His regular album releases reflect a myriad of styles and artistic growth over the years, stemming from a range of places like composition challenges, or soundtrack assignments. Emily: Can you tell me about your background in music? Ben Burnes: Well I grew up around music in some form or another. When I was very young, my dad would always have orchestral or jazz albums playing on the speakers. When I was in middle and high school, I played trombone in band. I don’t really have any “formal” training when it comes to writing music, aside from learning the basics of music theory from a bunch of sites online. A lot of what I’ve done has been trial and error, which can be a good way to try new things sometimes… but it ends up taking much longer. Emily: How did you put together your first album, Nature’s Echo? Ben Burnes: A very long time ago there was a site called SectionZ. It was a tight-knit community of musicians who were dedicated to making music for fun and enhancing their craft through detailed feedback and critiques of their peers. Nature’s Echo was built on much of the work I published on that site. In fact the name Nature’s Echo was actually suggested by one of the users there! There were many unofficial albums before Nature’s Echo as well. Every year, as a poor college student, I would put together a mixtape of the best music I made over the course of the year and would give it as gifts at Christmastime. About a year ago I compiled all that old music into an album called Formative. Honestly, I’m a bit shy with the old music, but I am always so interested in where other artists came from, and what their incredibly early work sounded like. I felt like I should give that opportunity to others if they wanted to trudge through it! Emily: What was the first soundtrack you composed for, and how did you come to be on board for it? Ben Burnes: The first soundtrack I wrote was The Maker’s Eden, Act 1. The game was a point and click adventure that used beautifully hand-drawn environments rendered in 3D. The game is set in a futuristic world, but with a strong noir, investigative feel. The soundtrack, which also has an Act 2, evolved to become this mix between a dark, electronic jazz with some orchestral overtones. It was a very ambitious project for me at the time, honestly. I felt a bit over my head. But that pressure turned into some of the most interesting music I had written to date. The main gameplay tracks were designed to layer on top of each other. So we have an “Ambient”, “Exploration”, and “Cinematic” layer that can be faded in whenever the tone of the story changed. I love creating music that has more interaction with the game than just reinforcing the tone of the visuals. I’m actually working on Act 3 right now! Hopefully it’ll be out in a few months. Getting that job is its own story. I had met Del, one of the developers on the game, a year or two prior on a Starbound IRC channel. She managed a few Minecraft servers and did some game development on the side. We had chatted a bit and followed each other on Twitter and that was about it. Months later I release the album Thirteen is my Favorite Prime, and Del must have gotten her hands on it and listened. A few days after the release I get a message from her asking if I wanted to be a part of a new game project that she was starting up. I love telling this story because it does a great job illustrating that if you want to get jobs as an artist, you need to always be making and sharing your art. You can’t just sit on a portfolio and expect people to come to you. I actually touch on this a bit in one of my more recent Creative Exploration videos. Emily: Three Red Hearts and PixelMinuteGames, while both chiptune albums, have very different styles. How did you approach those projects? Ben Burnes: I think it’s the nature of how those projects actually came about! A few years ago, I was brought in touch with a guy who went by Lessmilk. He was learning a game engine called Phaser and was challenging himself to make a new game every week. Initially, he asked if he could use some of my already existing music inside his games so there would be some background songs. As his challenge went on, I got swept up in the fever and started writing a new song for him every week, mostly chiptune-themed. In the end he made 15 or so games over the course of a few months. Once production slowed down a bit, I started learning a piece of software called Famitracker, which is a Nintendo soundchip emulator. Since a lot of the music that I made for Lessmilk was within the realm of chiptune already, I used those songs as learning projects to get better at using Famitracker. I’ve found it’s very helpful when learning to just copy other people’s work rather than trying to learn new software and be creative at the same time. The PixelMinuteGames volumes on the other hand are more commissioned work. I worked with their studio for over a year making music for their mobile games. It was a lot of fun to stretch Famitracker and see how far it would go with it’s simple limitations. Since many of the games required two or three songs each, it became a challenge to establish a theme, and then make variations on that theme across several songs. See, the NES hardware was extremely limited; you only had four main instruments, three that could produce notes and one that could make noise (for percussion and sound effects). Each of those instruments could only play one note at a time, so chords and complex harmonies were a bit of a commodity. Listening to the soundtracks of old NES games, it’s pretty incredible what musicians back then were able to accomplish. Emily: You wrote Covered in Cats as a challenge to create an original album in a month. What inspired the theme and genre of the album? Ben Burnes: Covered in Cats was actually the third “album in a month” challenge I had done! Two years prior I made Do This Justice and before that there was Dream State. I love these challenges because it severely limits your creative possibilities. It forces you to focus on the task at hand and just get things done. The challenge is going on right now, actually! It’s called the National Solo Album Month. As far as the theme for Covered in Cats, that all tends to crystallize as things come together during the process. I knew a few tracks I wanted to try making, and I had a smattering of lyrics I had written before (I had actually written the lyrics for Through the Noise a decade prior), but beyond that I just made whatever came to mind at the time. My wife and I had four cats at the time the album was made. Each one of them represented in the album artwork. It was very frequent when one was literally covered in cats. By far not the worst thing in the world, but 40 lbs of cat on you is still a lot of cat. I’m kinda bummed I’m missing the NaSoAlMo this year, but there’s just so much going on with my game and other projects! Emily: Let’s talk about your newest release, Color Jumper. Can you tell me about that project? 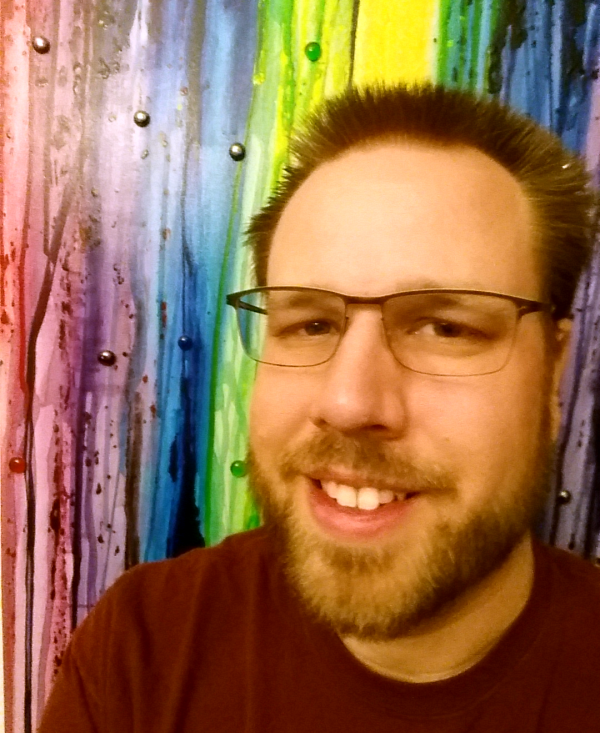 Ben Burnes: Color Jumper started over two years ago. I had just picked up Unity and made a few crummy prototypes when I got this idea of making a platformer similar to Super Meat Boy, but with a puzzle mechanic. I had been playing a lot of precision platformer games at the time like VVVVVV, Downwell, and INK. They all kind of swirled together and the idea of tying the action of Super Meat Boy with the cerebral puzzle solving of a color matching game could actually be really compelling. But things slowly started coming together into an actual game. I started showing it to people and they gave really positive feedback. It was great encouragement to keep going and make something “real” out of it. When I was a kid I used to make crummy games in QBasic on my Commodore 64 computer. Was always a big dream of mine to release a game that people can play! My favorite thing about Color Jumper is when you got all the muscle memory down and you can breeze through levels like breathing. It feels very beautiful and elegant when executed well. It has a very strong parkour feeling to it. I am very much hoping that the speedrunning community gives the game a shot because I think it would be really fun to watch. Emily: What else would you like to share about your experience as a composer? Ben Burnes: It’s important to be multi-faceted. I’m not saying you should lose your mind like I did and make a full game. But I feel it’s important to have a basic understanding of visual art and game development on a fundamental level. It will not only help you better communicate with other artists or developers, but it will give you a deeper understanding of their work and how you can interact with them. Beyond that, if I could give one more piece of advice, it’s to just never stop making things. You cannot hone your craft without always spending time at it. The best thing about making things just for yourself, is that you are able to fail without consequence. And failure is the best time to learn. Once you make a mistake, you can evaluate what went wrong and make sure it doesn’t happen again. If that happens during a project, it could end up being costly, either in time or money. This has the added bonus of always having new content to put out there, getting more new people interested in your work. I have a series on YouTube that dives into all the various facets of creativity and making things called Creative Exploration. I feel like it’s a good distillation of things an artist can do to enhance their creative output and reach. Thanks so much for your time and asking these questions! It was a lot of fun talking with you. Posted on November 3, 2017 by Emily McMillan. Last modified on November 3, 2017. I remember him from the Artist community of Section Z. I am not sure if i ever collaborated with him from there, but i remember chatting with him and used to listen to, and review his work. He was really good back then and has gotten far in the scheme of things musical today. Long live the Z.